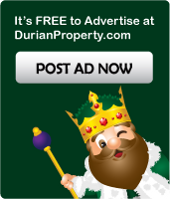 www.DurianProperty.com.my uses reasonable efforts to include accurate and up to date information. However, www.DurianProperty.com.my makes no warranties or representations as to its accuracy. In particular, www.DurianProperty.com.my assumes no liability or responsibility for any errors or omissions in the content of the Site. Everything on the Site is provided on an "as is" basis without any representation, endorsement or warranty of any kind, either express or implied, including, but not limited to, warranties of title, merchantability or fitness for a particular purpose or non-infringement. There is no refund/ cancellation/ termination of membership upon signing up/ payment of the membership or credits top up. If you believe that your property has been used in any way that would be considered copyright infringement or a violation of your intellectual property rights, our copyright agent may be contacted at the following email address info@durianproperty.com.